Looks like there’s a trend shaping up where furniture is getting added functionality by embedding electricitant magicality into it. Just look at Wood.e. Well now, Swedish company Brighthandle.com has come up with a door handle that very elegantly tells you whether the door is locked or not. 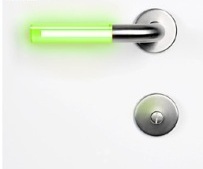 An LED continuously glows red when busy and green when good to go. Electricity is supplied via wires running in the door. Course, you could get the same functionality by rigging a little sign to go from “vacant” to “occupied”, the way they have them in porta-potties. But, how swanky would that be?